Do you not find there’s an earphones overload on the market these days? You go into an HMV or similar and are confronted by an entire wall with earphones ranging from about £4.99 upwards, all different colours, quality etc. Where do you start? 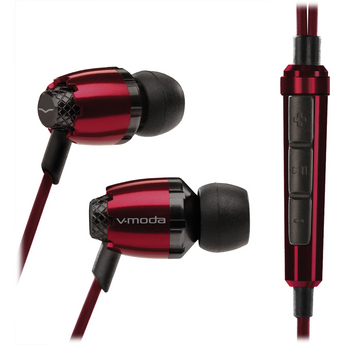 A nice all rounder is the V-Moda Remix Remote earphones. Although they aren’t the cheapest of earphones at $99 (£64), you can be guaranteed good quality sound and they look good… really good! V-Moda have clearly put a lot of effort into their design. Their metallic finish works really well, especially with the red pair. The V-Moda Remix Remote comes in black, red, silver and pink (nero, rouge, chrome and blush on the website). It has a decent cord length which is a huge plus as I find that a lot of earphones are rather short and you don’t have quite as much flexibility. The remote has the standard play, pause and volume buttons but is super slim which again is a great design feature. The box also includes different sized ear fittings, as well as an over the ear fitting and a little bag to put everything in. The presentation is great and perfect if you’re buying a present. I would give the V-Moda Remix Remote earphones a stylish 9/10. Previous Previous post: Don’t go zombie!